Fountain pens were once the writing instruments that ruled all others. In a relatively short period of time, the ballpoint pen was able to overthrow the kings of old. Sometime around the mid-twentieth century, ballpoints had clearly become the de facto standard. While fountain pen usage was on the wane, it never went away completely. 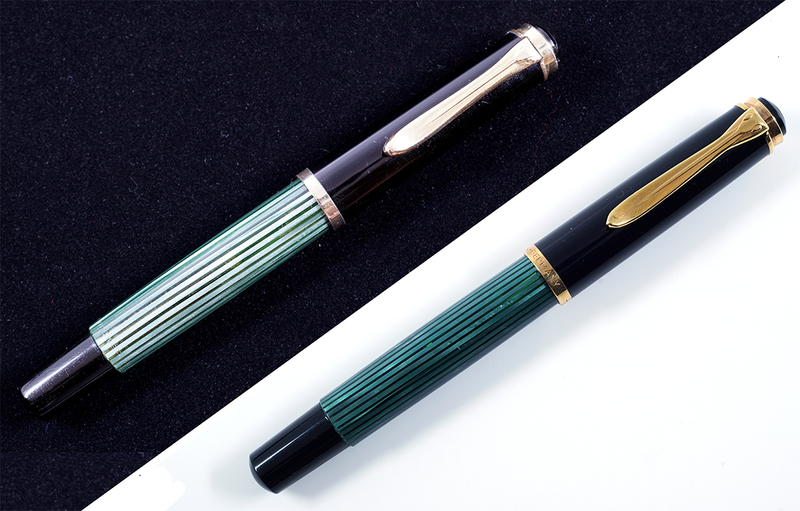 By the early 1980s, Pelikan saw an opportunity for a revival of sorts. No longer the essential tool for daily life that it once was, the fountain pen was again being taken up, this time as more of a status symbol or collectors item. The early 1980s would come to herald what could be considered a fountain pen renaissance. 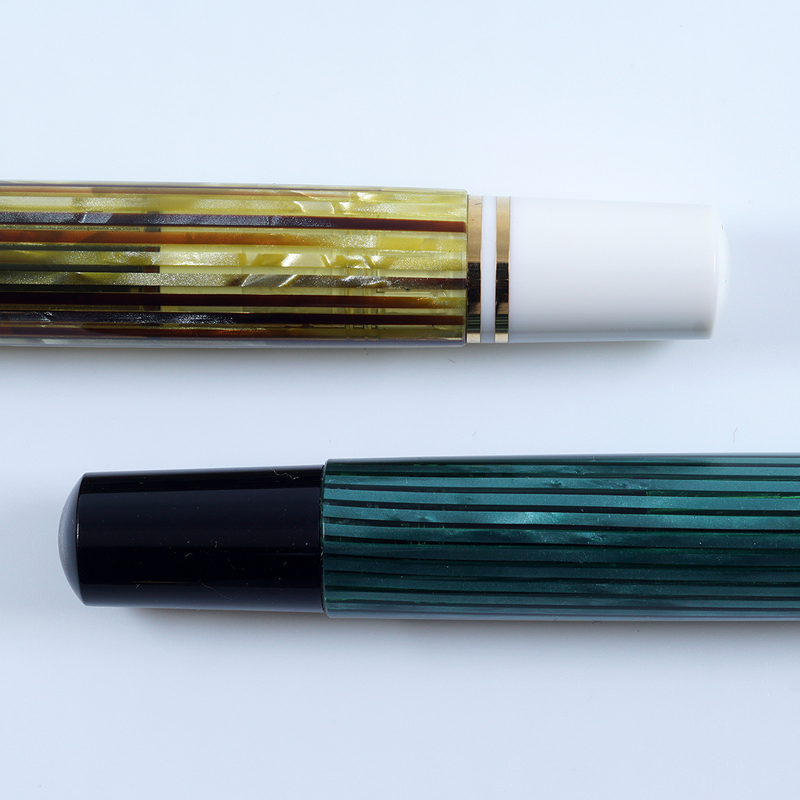 It was 1982 when Pelikan chose to try to capture this market with the re-introduction of the 400, a pen that the company had a lot of success with decades earlier. With little in the way of cosmetic differences, the new model would be called the M400 and it would become the cornerstone of a high end line of pens known as the Souverän series, a moniker likely prompted by Montblanc’s long standing Meisterstück. Quite perilously, this came at a troubled time for Pelikan as a rapid expansion of the business in the late 1970s resulted in the company having to declare bankruptcy right around the time of the M400’s release. The company was ultimately taken over and various divisions were parted out, either into subsidiary companies or sold off completely. It is lucky for us that the production of fine writing instruments would survive this tumultuous time. What separates the 400 from the M400? How do you identify the subtle and not so subtle differences between the two? Read on to find out. 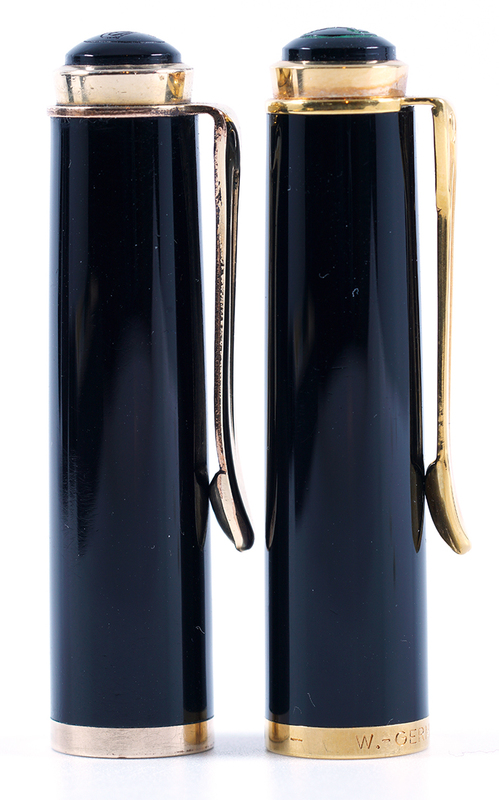 The original Pelikan model 400 was produced from 1950-1956 though production of the “400” would extend to 1965 and beyond. You can read more about that particular history here. The M400 Souverän has had two lives. The original model was introduced in 1982 and was produced until 1997. 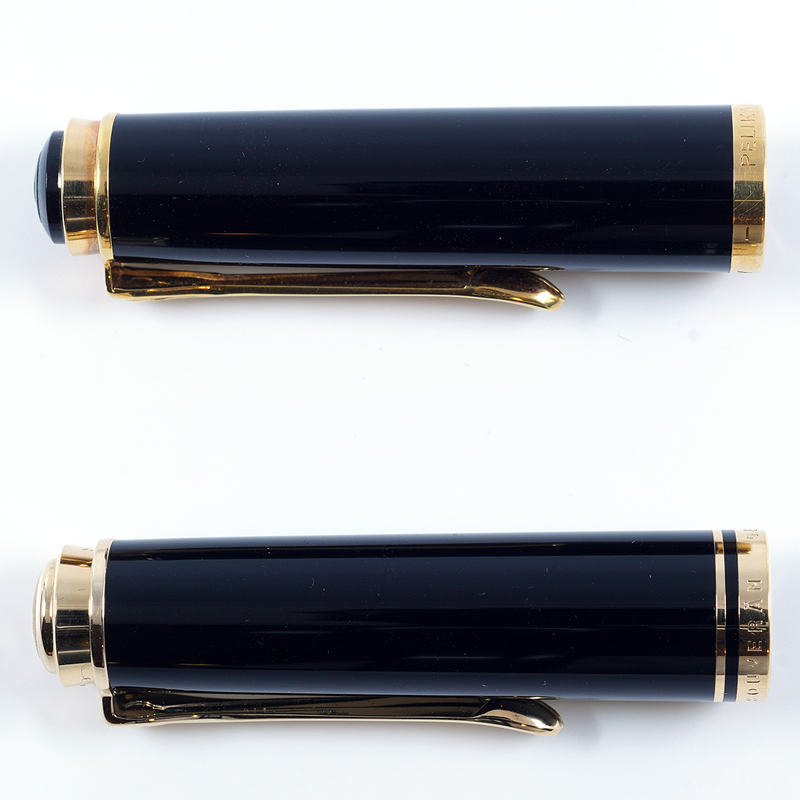 Frequently referred to as “old-style” or “pre-’97,” this pen is the one that most closely resembles the 1950s model. Production of the M400 persisted after 1997 and continues to this day. That “new-style” or “post-’97” model is a significant deviation from the original due to the addition of several embellishments. What I will try to do going forward is to highlight the differences between the 400 (1950-56) and the M400 (1982-97). Following that, I will also demonstrate the changes that have occurred to the line since 1997. Without further ado, let’s get to it. The cap of the 400 has a metal sleeve molded inside of the cap lip, presumably engineered to prevent the cap from cracking. Unfortunately, this has been implicated in some of the caps developing hairline cracks as the outer plastic aged and shrunk around the metal. The M400 cap employs an all plastic construction, omitting the metal sleeve. The beak clips between the two have essentially the same visual appearance when seen head on. The clip of the original 400 is made of a brass alloy whereas the M400 utilizes a steel alloy. This can result in the M400 clip being weakly magnetic. Both base metals are gold-plated. If you look at the 90 degree bend in the beak clip at the cap top, you’ll notice that the 400 is subtly thicker than that of the M400. 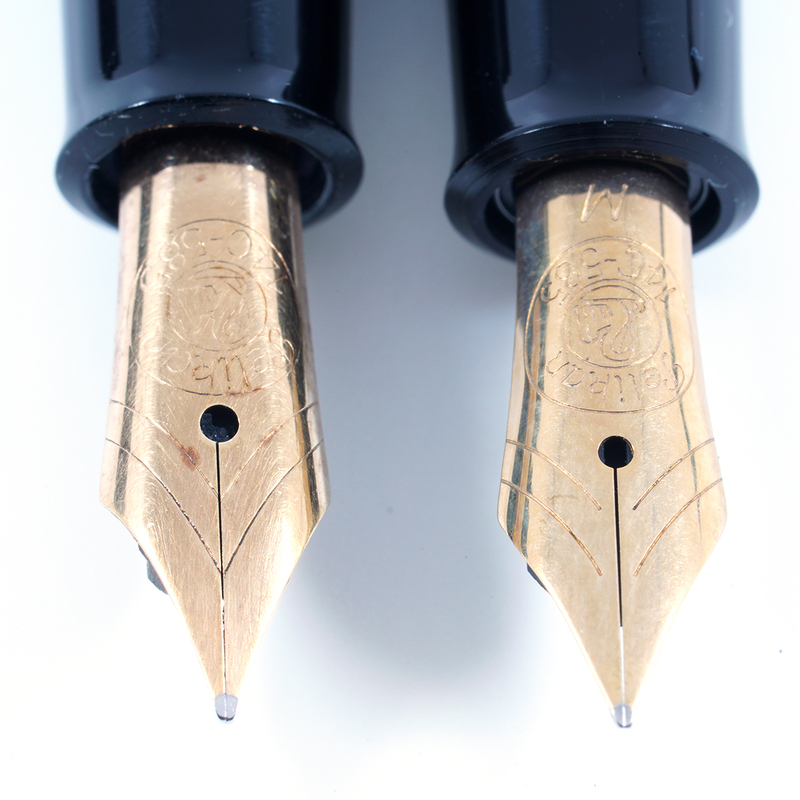 The logo nib was first introduced in 1954 and can be found on later examples of the original model 400. These depict a chevron whose lines meet at the nib’s slit. The design of that nib would change very little, even many decades later. On the M400, the chevron’s lines no longer meet at the slit, a change that had originally occurred around 1964. Also, the nib size (when present) is a regular font on the 400 whereas it is italicized on the M400. 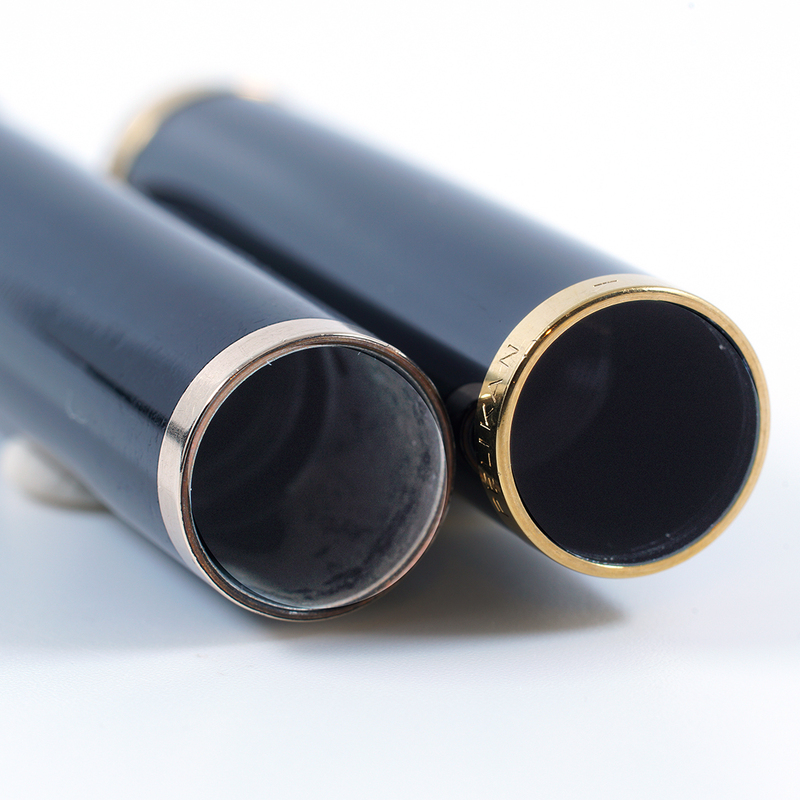 Both nibs have a monotone appearance and are generally made of 14C-585 gold. Looking at the feed is perhaps one of the quickest and easiest ways to distinguish between the two models. The 400 was equipped with a hard rubber (ebonite) feed consisting of four vertically aligned fins. The M400 feed is made from plastic and consists of many horizontal fins. 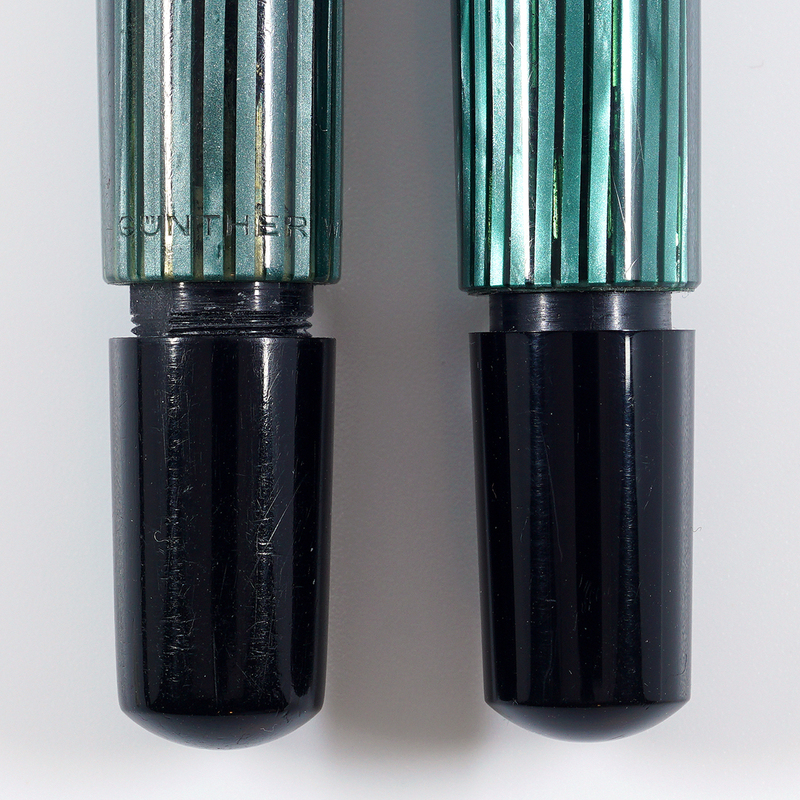 The barrel of the original green/black striped 400 shows a lot of variability between the stripes with obvious irregularities and different shades of green which serves to give each pen a very unique look. The striped pattern of the modern M400 has a much more uniform appearance overall. When the piston knob is actuated (e.g. the piston is extended for filling) on the original 400, threads can be seen on the mechanism below. These are absent from the M400 indicating a slight modification/update of the piston filling mechanism though the underlying mechanics were largely unchanged. On the original 400, the cap threads on the section touch the sleeve of the barrel. On the M400, those threads terminate in a thin, plastic ring before reaching the sleeve. The red arrows below highlight this subtle but clear difference between the two eras of production (tip courtesy of Cristian). There are some other minor footnotes that may be of interest. The 400s made from 1950 to mid-1954 lack any engraving on the cap band whereas all M400s will have a cap band engraving. When an engraving is present, the 400 will often read “Pelikan 400 Pelikan 400 Pelikan 400” or “Pelikan 400 – Germany.” M400 cap bands show some variation of “Pelikan – Germany” (described in further detail below). Both cap tops are etched and depict the two chick company logo. 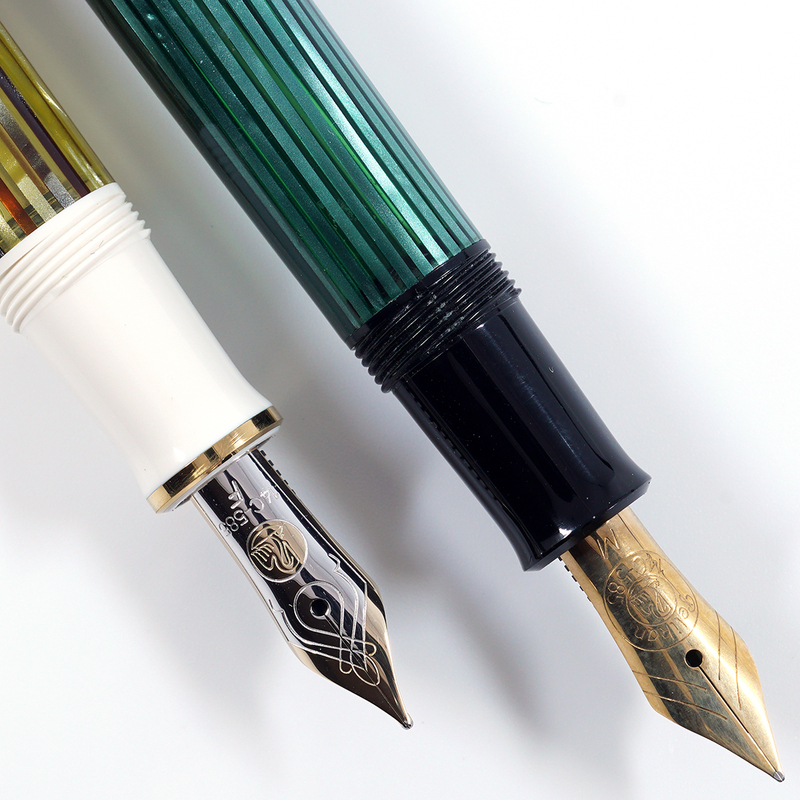 Pelikan experimented with friction fit nibs for a period of only three months when the 400 was released. They again attempted this with the M400 and again quickly abandoned it so both models can infrequently be found on the secondary market with friction fit nibs. The barrels of the 400 were often stamped and may include phrases such as “Export Günther Wagner Pelikan,” “Günther Wagner Pelikan,” or “Pelikan 400 Günther Wagner Germany.” The piston knobs of the early 400s may also have had the pen’s nib size imprinted upon it. None of that was ever the case with the M400. Finally, the 400s made from 1950-54 had script nibs whereas the M400 has only ever known a variant of the logo nib. All in all, despite these differences, both pens do have a very similar appearance. Hopefully, you will now be more readily able to identify which is which based on the features identified above. 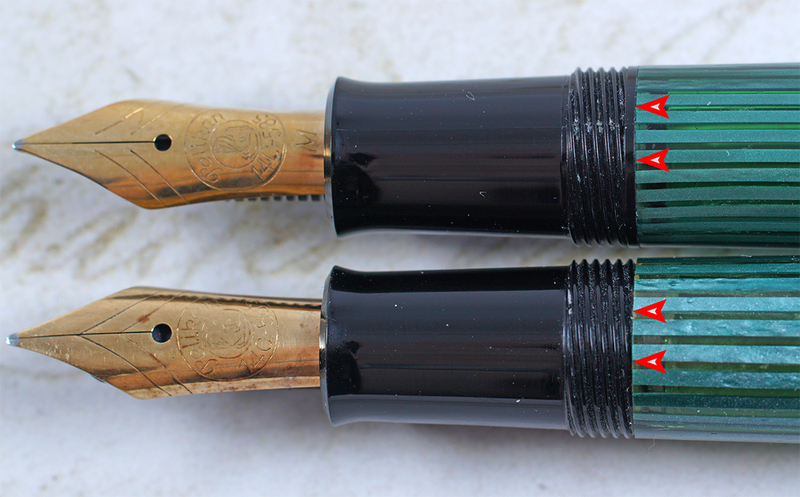 The cap tops of the old-style M400 are etched and depict Pelikan’s two chick logo. After 1997, the cap top logo would be painted on top of rather than etched into the plastic. As of 2003, that logo changed and from then on just showed a single chick in the nest. Around 2010, the cap top became 24C gold-plated which is what we have today. If you’re keeping track, that is four different cap top configurations employed on the M400 over its 37 year production run. The company’s use of the logo nib lasted from December 1954 to 1997 with little variation in design. 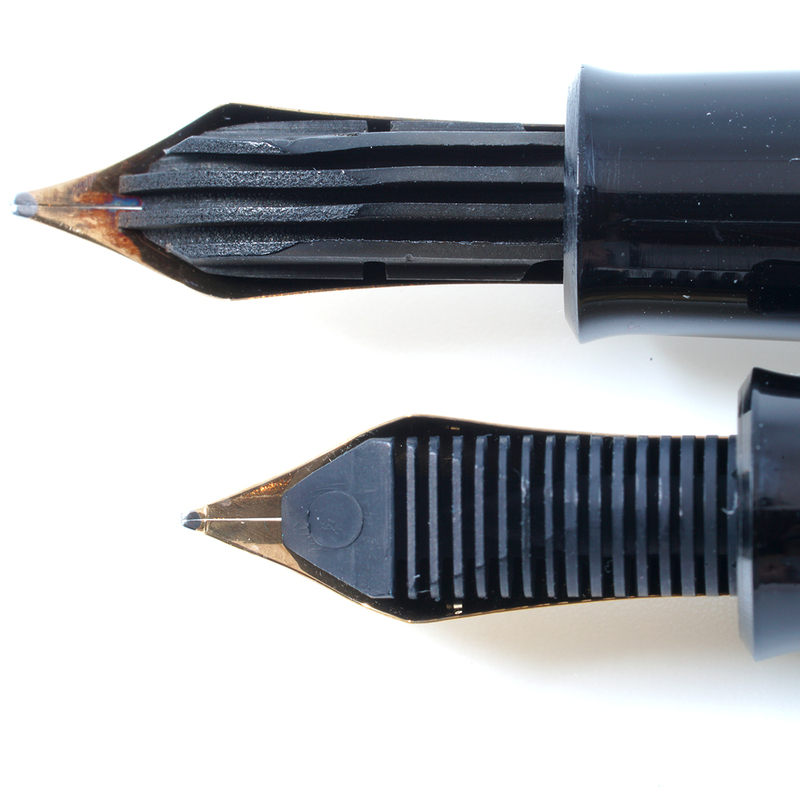 The trim changes that occurred in 1997 also brought a significant revision of the nib. The monotone yellow gold appearance was eschewed in favor of a two-toned veneer achieved via rhodium plating. The simple chevrons were replaced with a much fancier scroll work that is still the standard today. When the line was revised in 1997, one of the changes included the addition of a single gold-plated trim ring on the section. While the ornamentation added to the pen’s upscale appearance, it also makes a good case for form over function. You may find models that show plating loss and corrosion as prolonged exposure to certain inks can damage this ring. Just as the section received new gilding, the previously plain piston knob of the M400 received a bit of glitz with the addition of not one but two trim rings. There you have it. I’ve done my best to explore all of the differences between these models but certainly may have missed a nuance or two. I hope that this will serve as a helpful resource, one that allows you to more easily distinguish between the models. While all of the above pens are great in their own way, I do have a soft spot in my heart for the original 400 and the old-style M400. What they lack in gold adornment, they make up for with pure character. Christof Z. FPnuts.com: The Fountain Pen Board. 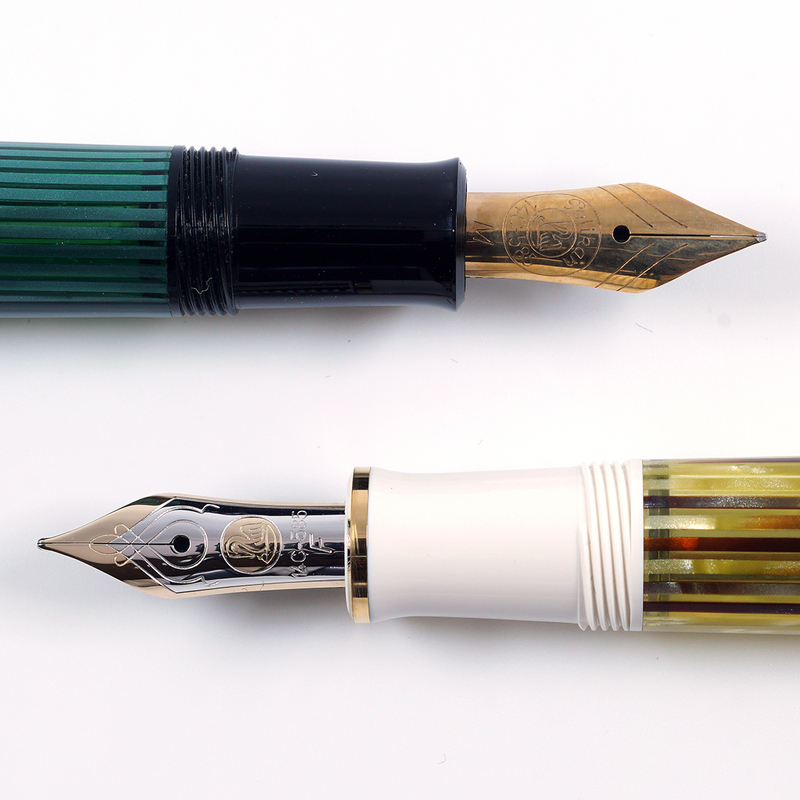 “Differences between Pelikan 400 from 1950’s and Pelikan M400 from 1980’s.” 12/27/2013. Last accessed 2/28/19. Collecting is sometimes all about the details, isn’t it? This is very helpful, as always. And I like to be all about the details. Thanks for a very informative piece Joshua, I started with an old style M600 which had been sold to me as an M400 back in 1990 and I have been a fan of the 400/M400 ever since. They just seem to be the perfect size for me in spite of having fairly large hands. You’re welcome. Those old style M600s are still frequently misidentified at auction. I agree that they are the perfect size, especially when posted. Well done. Always enjoy the detail that makes your blog so readable. For all the “hundreds” of pens in the collection, the 400 Torts are still one of my very favorites. Thanks for another great article Joshua! They are hard to overlook. Glad you liked the article. Well done as usual. Makes me want to pick up a vintage 400 more than ever. Have an M400, a White Tortoise that lives in my pocket. I think that you’d get along well with a 400. Hopefully one finds its way to your flock some day. Thanks Joshua for yet another interesting article! I’ve read somewhere that the nibs of the 400/400N/400NN-models are quite flexible and know the modern M400 (post 1997) isn’t. But how flexible is the nib of the first M400 (1982-1997)? The nib itself looks a lot like the one of the original 400, but the feed seems to be the same of the post 1997 M400. Thank you for any information regarding this question. I’d say that the pre-97 nibs fall somewhere between the two. Not quite as nice as the vintage offerings but well ahead of what we have today. Once again – a very useful and well thought out piece! Thanks. As I read it, I was looking at my stable of uncertain-dates 100s and 200s and am wondering if the metal-cap-liner engineering change and the direction change of the feed ribs were made across all lines around the same time, e.g. 100 and 200 series. Some of these things are better documented than others and there has always been a lot of overlap so exact dates are hard to know for sure. Joshua thanks for the this piece which incited me to buy a Pelikan 400 I came across and sold by an eBay seller. It would definitely appear to be a 1950s model. However, the piston filler knob is much more rounded (and pleasing to me) than the pictures I have seen of other 1950s’ 400s provided in your piece or in the link to the 2013 piece. Glad to have inspired the purchase though your description is interesting. Send me a pic or two if you’d like and I’d be happy to take a look. Thanks for the excellent article.. must start attending the pen shows, at least from next year onwards..
You’re welcome. The shows are well worth it if you are able.